This is not a detailed review of Infocom's Trinity, because Jimmy Maher has just finished that job. His sequence of posts (1, 2, 3, 4, 5, 6, 7, 8, 9) puts the game into its context in Infocom's history and, more broadly, in the history of the Atomic Age (remember that?) and the Cold War. Go read. Inevitably Maher comes around to the question of the ending -- the "...what just happened?" denouement. (You can read just that one post if you're familiar with the game.) It's not the first time, of course. Maher links to a Usenet thread in which we went 'round this topic in 2001. But today I am moved to be argumentative. If I were the author of Trinity, what would I have done? Continue reading Trinity: design ruminations. Tags: Brian Moriarty, if, Infocom, interactive fiction, Trinity. 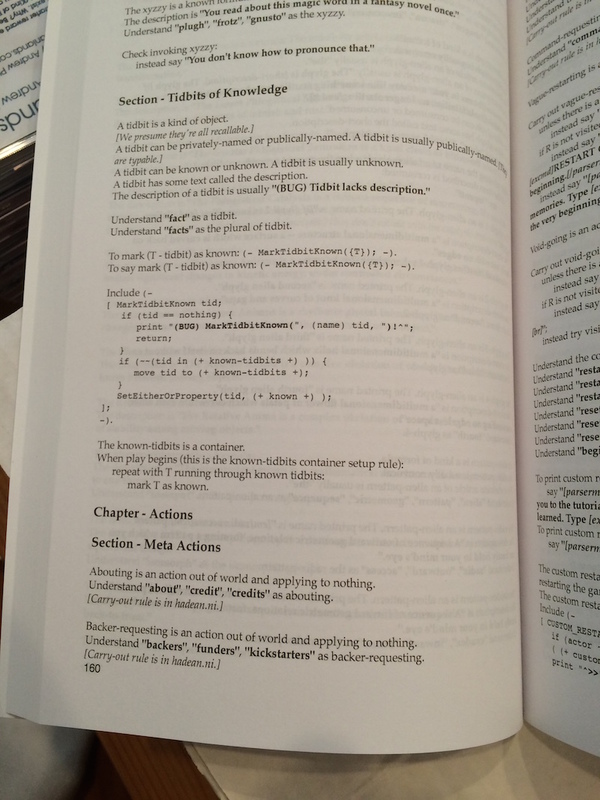 One of my limited, high-level Kickstarter rewards was "The Hadean Lands source code, in book form". I had these printed in January, I mailed them out last week, and some of my backers have already received them. They're a hit! That last is an excellent question. 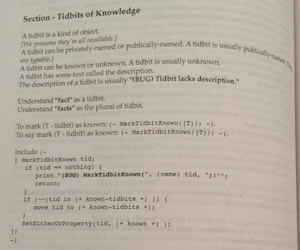 Everybody deserves nicely-printed source code, so here's how I did it. Continue reading Sweet formatting for Inform 7 source code. Tags: if, inform 7, interactive fiction, printed artifacts, syntax coloring.